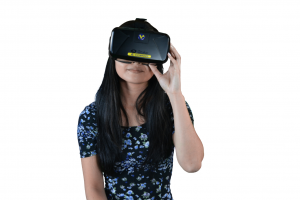 Immersive VR sales presentation by Virtual Worlds. Virtual Worlds 4D is our entry level immersive Virtual Reality buying experience, designed to give your customer an insight into how their new room will look from within. Once a design is created in Virtual Worlds Professional, the customer can put on a virtual reality headset and be immersed in their proposed new room. For the designer, a simple click of a button is all it takes to allow your customer to try before they buy. 4D can be used both in the showroom and in mobile presentations on a laptop PC. Once immersed in their room design, the customer has a real sense of being there. They can move around and open doors and drawers gaining a better sense of spatial awareness and product information, helping them make a purchase decision quicker than is possible through consultation alone. With over 200 retailers now selling kitchens and bathrooms in 4D, and reports of 20% increase in sales value and 30% increase in conversion rates when comparing 4D to 3D presentations, 4D is a wise investment.